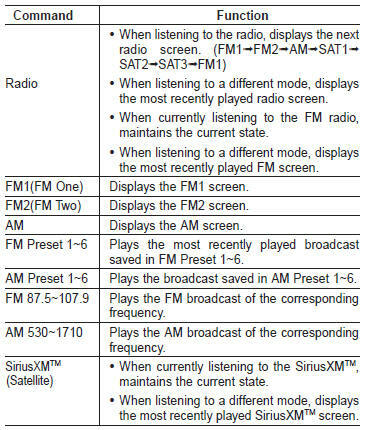 Commands available during FM, AM radio operation. 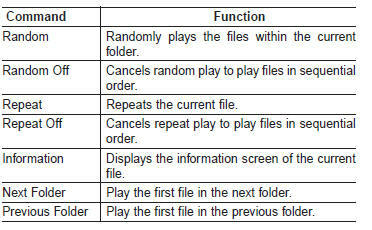 Commands available during USB operation. 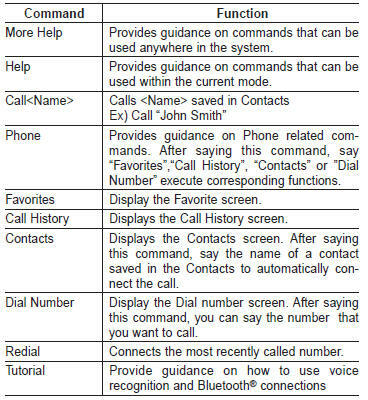 Commands available during iPod® operation. Commands available during My Music operation. Bluetooth® Wireless Technology Audio Commands: Commands available during Bluetooth® Wireless Technology audio streaming from mobile phone operation Command Operation. SiriusXM™ service requires a subscription, sold separately, after 3-month trial included with vehicle purchase. If you decide to continue your SiriusXM™ service at the end of your trial subscription, the plan you choose will automatically renew and bill at then-current rates until you call us at 1-866-635-2349 to cancel. 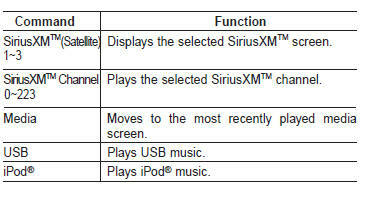 See our Customer Agreement for complete terms at www.siriusxm.com. Other fees and taxes apply. All fees and programming are subject to change. Sirius satellite service is available only to those at least 18 and older in the 48 contiguous USA, D.C., and PR (with coverage limitations). Our Internet radio service is available throughout our satellite service area and in AK and HI. Certain channels are not available on our Internet radio service or on mobile devices. SiriusXM Traffic available in select markets. See siriusxm.com/traffic for more information. © 2013 Sirius XM Radio Inc. Sirius, XM and all related marks and logos are trademarks of Sirius XM Radio Inc. iPod® is a registered trademark of Apple Inc. iPod® mobile digital device sold separately. A Bluetooth® enabled cell phone is required to use Bluetooth® wireless technology. All rights reserved.